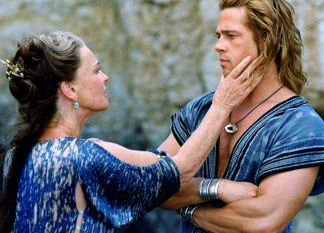 Though Mel Gibson may take issue, The Iliad is quite possibly the greatest story ever told. Troy, as told by director Wolfgang Petersen (Das Boot, Air Force One), manages to diminish this narrative, squishing a ten-year war into what seems like a fortnight, and trivialising the themes inherent in Greek poet Homer's original classic telling of this myth. As the story opens  and Troy takes story elements from these oft-told myths that are not contained in The Iliad  the various Greek city-states have been united under the thumb of Agamemnon (Brian Cox). But while he may be the king of kings, his army finds its strength in the bulging biceps of Achilles, a seemingly invincible warrior. Brought to sweaty, glisteningly bronzed life by Brad Pitt, Achilles is an arrogant, petulant hedonist who bristles at the thought that he serves at the beck and call of Agamemnon. But serve, however reluctantly, he does. The city of Troy is one of the few that has not fallen under Agamemnon's influence, a fact that irks the king to no end. But his opportunity to lay siege to Troy, a city whose famous walls have never been breached, only comes when his brother Menelaus, king of Sparta, has his wife Helen (Diane Kruger) stolen away by Paris, the weenie prince of Troy (Orlando Bloom). Diane Kruger, as Helen, is supposed to be "the face that launched 1,000 ships," and Petersen gets his computer-generated ya-yas out with some epic pull-back-and-reveal shots of those vessels that are generically Jackson-esque. But Orlando Bloom's Paris is in fact the pretty one in that relationship  just one element of the beefcakes-on-parade that is Troy. Paris makes a feeble attempt to challenge Menelaus for Helen's hand, but ends up whimpering behind his bigger brother, Hector (Eric Bana), who is the great strategist behind Troy's long-standing military success. Despite the abundance of hot Greek-on-Greek warrior action, the trio of Pitt, Bana and Bloom provide more eye candy than Petersen's special effects ever could; their shirtless, muscled forms are paraded so blatantly that it makes the battlefield look like a runway (or a Playgirl photo shoot). Which brings us to an interesting point about the gay context to Petersen's interpretation of The Iliad. (The screenplay is by 25th Hour scribe David Benioff.) In The Iliad, Achilles is (at minimum) bisexual  a fact that was of no note in Homer's time. But the driving moment of the action  the key event that brings Achilles reluctantly into the war against Troy  is the death of Achilles' boyfriend. Not so for Warner Bros., who shy away from such a blatantly gay motive by rewriting the boyfriend as a "cousin" to Achilles. To ensure that there's no doubt about what team the leather mini-skirt-wearing Achilles is playing on, the screenwriter gives him a Trojan slave girl with whom to fall so heterosexually in love. But the gay angle is but a minor tinker with this compelling narrative arc. The absence of the gods  or at least their reduction to abstractions  is a more complicated omission. In Greek mythology, the gods were real  that is, they watched and interacted with human life on earth. In fact, Achilles' incredible power derives from the fact that his mother is a god, and the thrust of the Trojan war is that it's a squabble between the gods over a beauty contest. But clearly Wolfgang Petersen has no interest in making a bigger budget Clash of the Titans, and thus replaces all the god talk with more mundane political motivations. He turns Achilles from an immortal warrior into a mercenary; it makes Agamemnon a more powerful figure than he actually was; and it leaves at least one major unexplained gap in the audience's understanding of the myth of Troy. Without the gods, so goes the myth of Achilles' creation  that he was made invincible by being dipped in a mythical river by his ankle. That uncovered spot  the famous heel that would be his downfall  becomes the only weakness in his armour. But without the myth, without the context to this spiritual journey, Achilles becomes just some buff guy who gets implausibly shot in the foot. So does this $200 million adaptation.